The Dog, Cat, and Cow all have specific roles/talents in the nursery rhyme—describe them. (Cat fiddles, Cow jumps, Dog laughs). 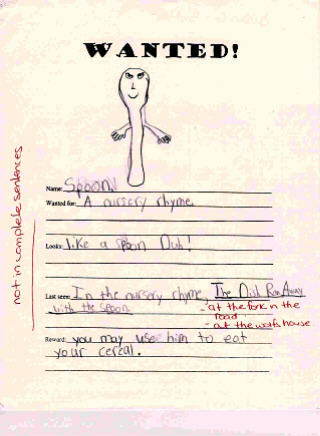 During the course of the journey to find Dish and Spoon, each one actually uses his/her talent—how? Who is on the “team” responsible for bringing back Dish and Spoon? Is there one leader or do they all take turns at leading? Describe at least 3 times when the main characters help each other / work as a team. Which other characters in the book help them? Which try to keep them from succeeding? Why are the characters making the journey? Does every character want to go on the journey? How might the story end if they don’t go? What is the main crisis? Is there a lesser crisis? How do the characters resolve the crisis? How do you know that Dish and Spoon do not want to run away again? Have students make a list of the objects in the wallpaper in Muffet’s house and Wolf’s house. Identify all nursery rhyme/fairy tale references in the book—in the text (“I can rub-a-dub-dub you down with a little seasoning . . .”), on the map and in the art (Jack’s repair shop). For reference, use a Mother Goose nursery rhyme book. How is Spider’s dialogue like his nursery rhyme? On Wolf’s wall, there is a picture of Wolf as a baby and his mother. How does this foreshadow events to come?